Decided to go to Roehl, finished phase 1 mid Feb. Got my CDL A Ready to go out with trainer next week for Phase 2. Good luck, Robert! I'm right behind you ... got my CDL last week and am starting with Roehl on Jan 29. I opted for the Atlanta GA location considering the time of year. I was in Conley on Jan 22, left this last thursday. We were there together. Sorry to jump this thread. Neal, hows it going? I was in the experienced group while you guys were in the phase training. I was the rehire. Lmk how everything went. Ah ya, I remember talking with you outside the classroom, went well, I'm just on home time waiting for trainer. Dart - Tracy here - just checking in on you - how you doing? Are you still with Roehl Tracy? I work for Roehl, the cameras aka "event recorders" only record when an event happens, ie...hard braking or an accident. They then send ten seconds of video from before the event and 10 seconds of video after the event. This video goes to a 3rd party company for review and is passed on to Roehl IF there is some sort of issue or problem that needs to be addressed. Roehl does not maintain video from the cameras, nor does Roehl ever see any video, unless there is a clear or perceived issue with something the driver did. Company policy allows for the removal of these driver facing cameras for experienced drivers. Though they are there for you and for Roehl's protection. The only reason to be concerned with them is if you are doing something that will get you into trouble. Going dry van in NE region. I've read your posts Tracey and have been glad to see you're so happy with Roehl. Made me think I've made the right choice. Thanks! Did you go to Conley??? 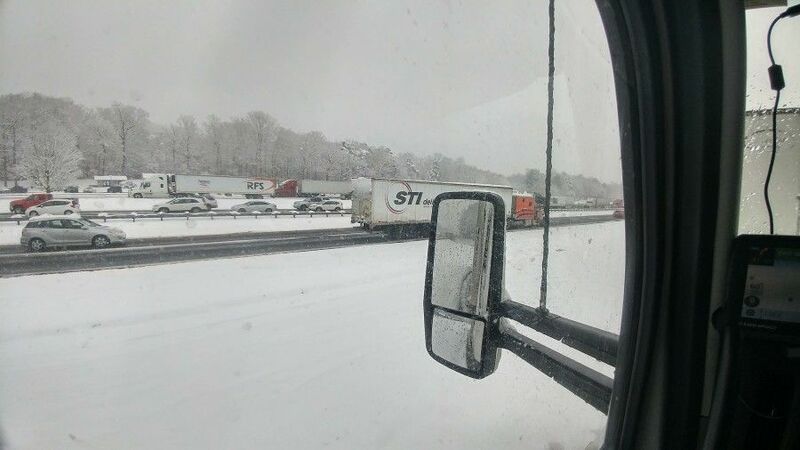 Here is a pick from I-40 in NC. I'm on the Eastbound side looking at the Westbound side. The trucks you see on the Westbound side are parked in the rest area. I'm in Greensboro, NC If all goes well, heading to Jim Palmer or Wil-Trans next week.